I don’t think, at this point, it’s any secret that I love the real-time strategy genre. It is, without a doubt, what brought me away from consoles and into the PC world with a vengeance and a permanence. Sure, I play the occasional console exclusive, especially on the Nintendo varieties, but PC is the focus for any multiplatform title. And, oh so many exclusives. We’re here for this, the genre that brought me to the light. The once pride and joy of PC gaming is far from its peak. Replacing what brought me to PC gaming in the first place, the FPS, to see the RTS usurped by a new-found love, the MMORPG. Only to see that replaced by the new hotness, the MOBA. I’ve stuck with each genre, gobbling them up with enthusiasm, warts and all, during the years. I’m oh so happy to return. You see Dawn of War is one of the most venerable intellectual properties in gaming. Any gaming. It led the way for the universe of StarCraft only to trail in its own creation for, well, forever. 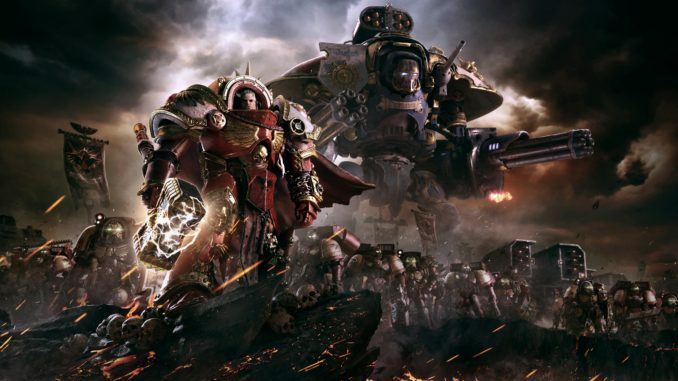 Thankfully, Games Workshop found a champion in Relic Entertainment back in 2004 – perfect timing after the massive gap drought in quality RTS games post StarCraft – capable of delivering Warhammer 40,000: Dawn of War with the developer’s refreshing take on the complicated genre. Three sequels, and expansion and a sequel later and Dawn of War III is on the precipice of release. I may be more excited than ever. Let me know if you can tell in the interview.